There's a part of me that's always wished I grew up in the 50s. Those old-time drugstores with soda fountains just always seem so kitschy and fun. 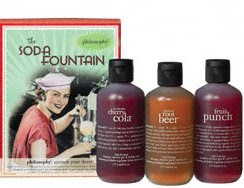 So I was totally stoked to discover the brand-new The Soda Fountain by Philosophy. I totally get the special opportunity of escaping to that soda fountain in the comfort of my own home ... or shower, as the case may be! My fave is definitely Root Beer, which literally does emanate the aroma of its moniker. Even my roommate swooned when I made him draw in a breath over the bottle! And as is the case with all Philosophy 3-in-1s, the bottles each have a recipe displayed across the front. You can actually learn how to make the three drinks! I will definitely be trying out these recipes, especially the root beer -- which, of course, the bottle says to pour over ice cream before serving. These three scents are absolutely perfect to take you through the end of summer and into the light crispness of early fall. So why not head to Philosophy's website and pick up your own time machine? It's only $30. Now all that's missing is my poodle skirt. These look heavenly, I need to sniff them!